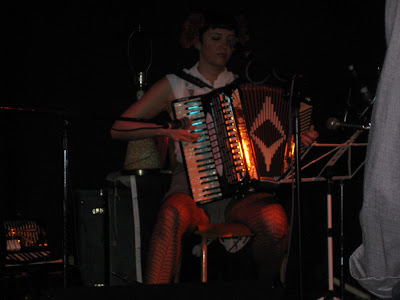 Accordion Noir's First Annual International Festival was such BLAST!!! 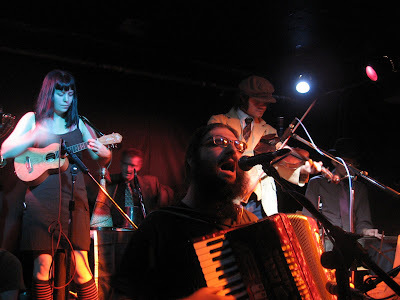 This night of furious accordionism all went down at the Railway Club in downtown Vancouver, British Columbia. Geoff Berner - Official Them Songwriter 2010 Vancouver - Whistler Olympic Games - "The Dead Children Were Worth It"
I was up first, nerves and crazy energy pulsing through me...I just really really needed to get up there and play, and was it ever FUN! A great crowd to play to, thank you great crowd!! Yes! The Creaking Planks! 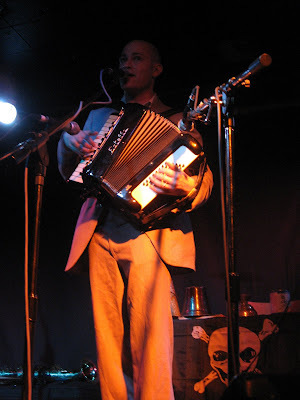 Rowan Lipkovits - the co-host for Accordion Noir Radio, is also the frontman and accordionist for The Creaking Planks. An explosive performance, they had every instrument up there, ukelele's, jaw harps, pots and pans, lamps, gut buckets, violins, steel guitars, trambones, smashing plates...and of course an accordion! 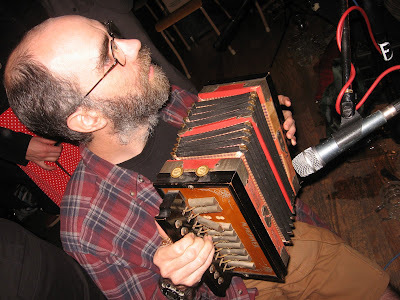 Bruce Triggs, the co-host of Accordion Noir Radio and the wonderful host of the Accordion Noir Festival. He pushed and pulled this ancient Hohner accordion creating bursts of mildew to tuft out the top, and sounded kind of droany into the microphone. Bruce and Rowan are very rad and you should listen to their radio show, every friday night on Co-Op Radio from 9:30pm - 10:30pm. I'm so thankful for this experience, I had such a great time, meeting everyone was so much fun, the crowd was great, a huge success!